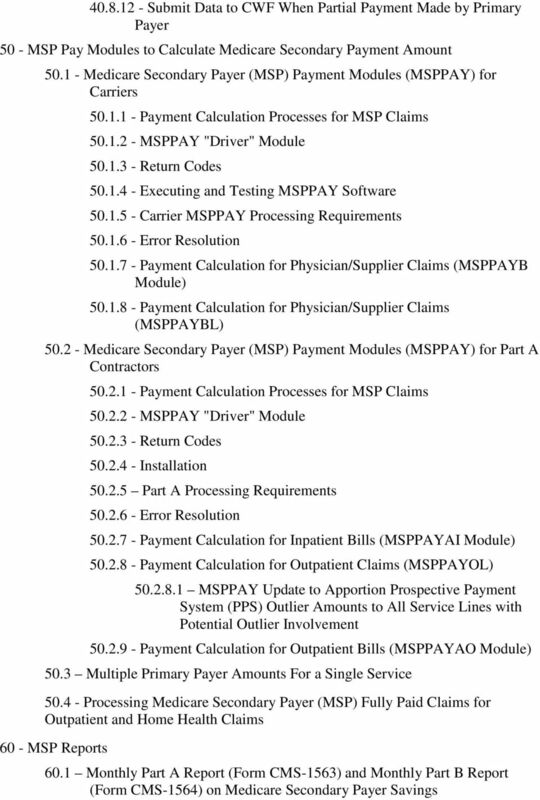 Download "Medicare Secondary Payer (MSP) Manual Chapter 5 - Contractor Prepayment Processing Requirements"
9 for the COBC s follow-up with the contractor as needed. This information shall be sent to the COBC s representative, Alberta Smythe at The following provides a description of the activities that are included in initial MSP development and the necessary action(s) of contractors Contractors MSP Auxiliary File Update Responsibility (Rev. 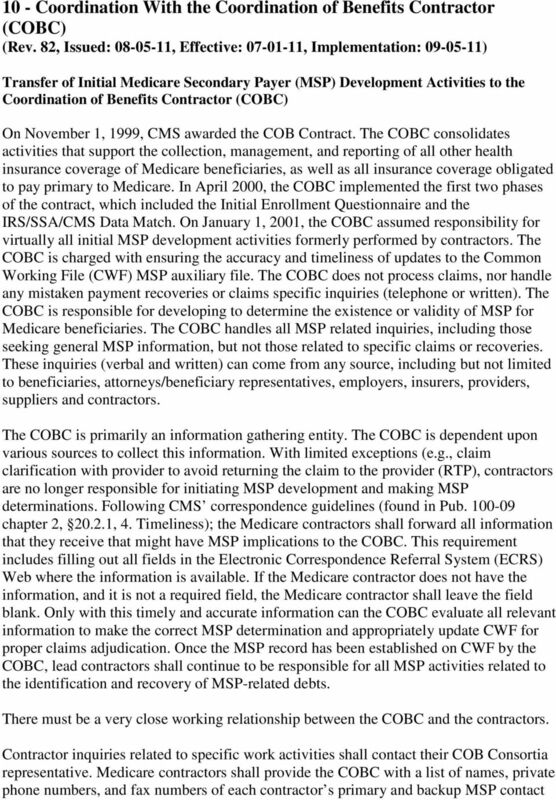 94, Issued: , Effective Date: , Implementation Date: ) The capability to update the CWF MSP auxiliary file is, essentially, a function of only the COBC. 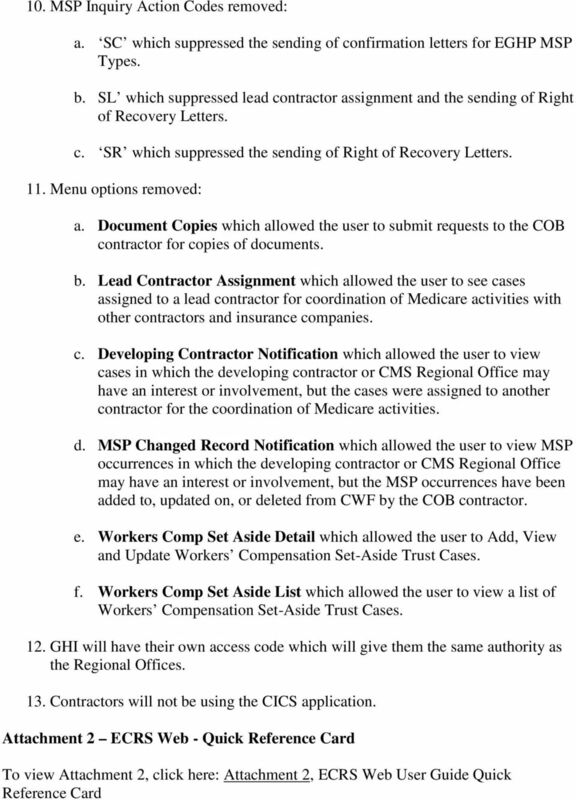 Contractors do not have the capability to delete any MSP auxiliary file records, including those they have established. 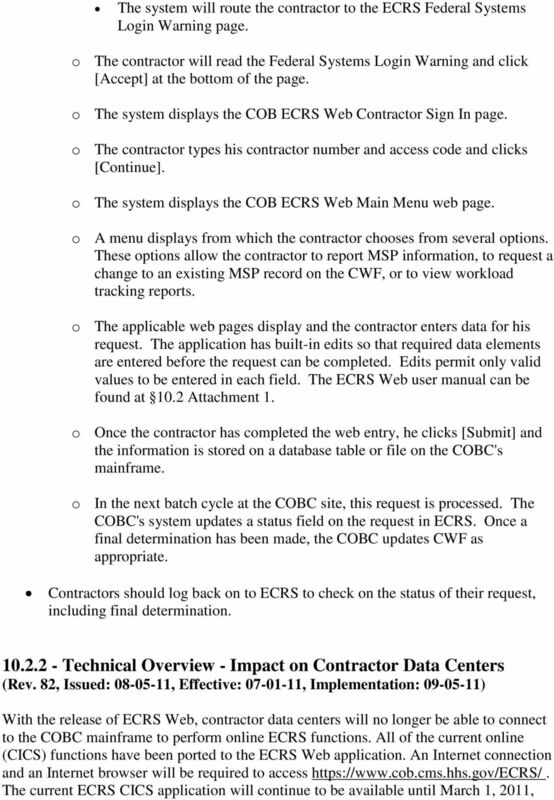 If they believe a record should be changed or deleted, they shall use the COBC ECRS Web (discussed in 10.2). 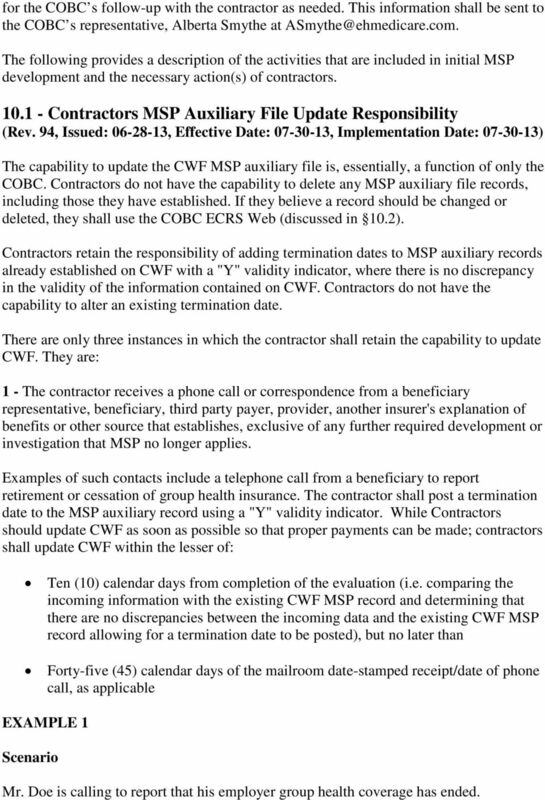 Contractors retain the responsibility of adding termination dates to MSP auxiliary records already established on CWF with a "Y" validity indicator, where there is no discrepancy in the validity of the information contained on CWF. Contractors do not have the capability to alter an existing termination date. There are only three instances in which the contractor shall retain the capability to update CWF. They are: 1 - The contractor receives a phone call or correspondence from a beneficiary representative, beneficiary, third party payer, provider, another insurer's explanation of benefits or other source that establishes, exclusive of any further required development or investigation that MSP no longer applies. Examples of such contacts include a telephone call from a beneficiary to report retirement or cessation of group health insurance. The contractor shall post a termination date to the MSP auxiliary record using a "Y" validity indicator. While Contractors should update CWF as soon as possible so that proper payments can be made; contractors shall update CWF within the lesser of: Ten (10) calendar days from completion of the evaluation (i.e. 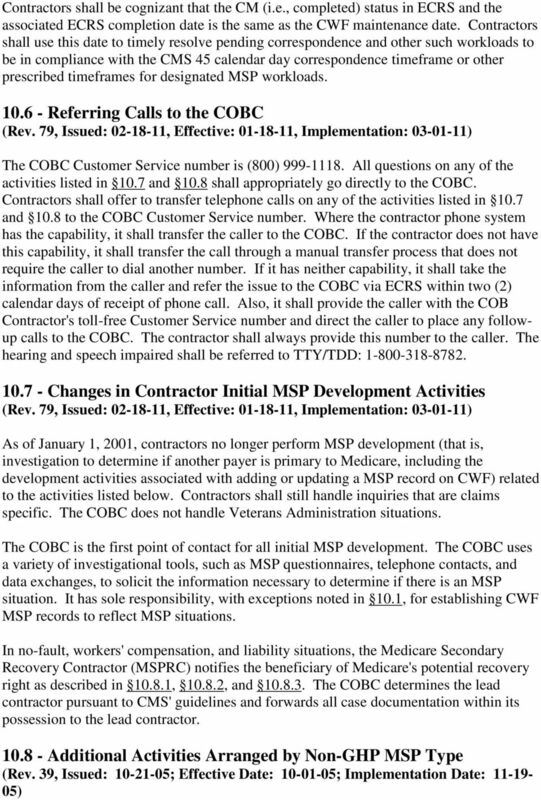 comparing the incoming information with the existing CWF MSP record and determining that there are no discrepancies between the incoming data and the existing CWF MSP record allowing for a termination date to be posted), but no later than Forty-five (45) calendar days of the mailroom date-stamped receipt/date of phone call, as applicable EXAMPLE 1 Scenario Mr. Doe is calling to report that his employer group health coverage has ended. 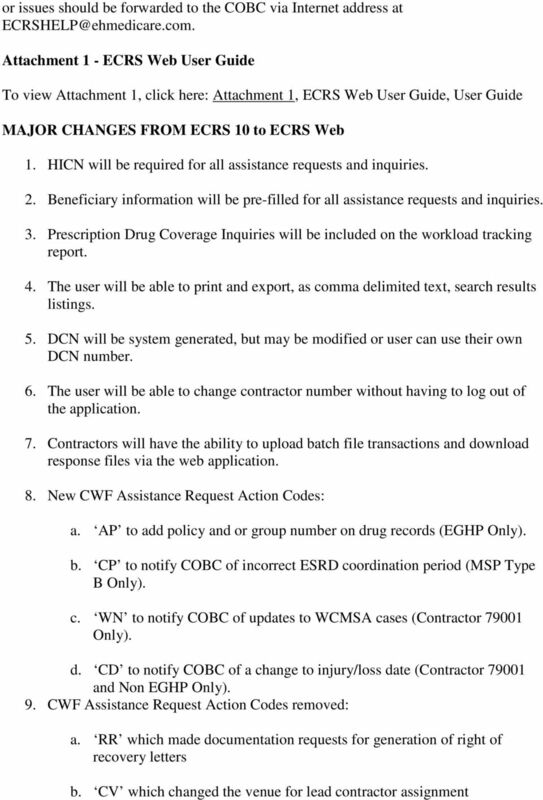 10 Contractor Action The contractor shall check for a matching auxiliary record on CWF and terminate the record if no conflicting data are present. If the contractor cannot add a termination date, the contractor shall submit a CWF assistance request (See 10.2 Attachment 1). The contractor shall not transfer the call to the COBC. EXAMPLE 2 Scenario Mrs. X is calling to report that she has retired. Contractor Action The contractor shall check for a matching auxiliary record on CWF and terminate the record if no conflicting data are present. If the contractor cannot add a termination date or if the date on CWF needs to be altered, the contractor shall submit a CWF assistance request (See 10.2 Attachment 1). The contractor shall not transfer the call to the COBC. 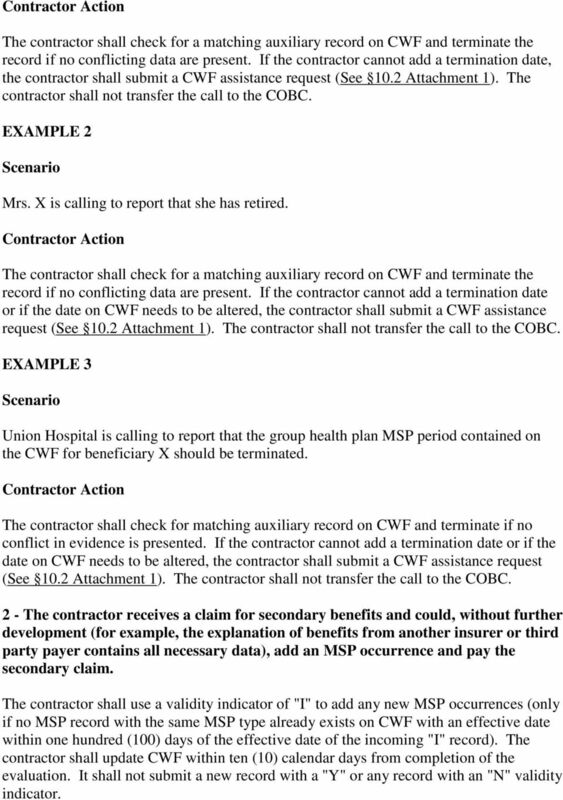 EXAMPLE 3 Scenario Union Hospital is calling to report that the group health plan MSP period contained on the CWF for beneficiary X should be terminated. Contractor Action The contractor shall check for matching auxiliary record on CWF and terminate if no conflict in evidence is presented. If the contractor cannot add a termination date or if the date on CWF needs to be altered, the contractor shall submit a CWF assistance request (See 10.2 Attachment 1). The contractor shall not transfer the call to the COBC. 2 - The contractor receives a claim for secondary benefits and could, without further development (for example, the explanation of benefits from another insurer or third party payer contains all necessary data), add an MSP occurrence and pay the secondary claim. The contractor shall use a validity indicator of "I" to add any new MSP occurrences (only if no MSP record with the same MSP type already exists on CWF with an effective date within one hundred (100) days of the effective date of the incoming "I" record). The contractor shall update CWF within ten (10) calendar days from completion of the evaluation. It shall not submit a new record with a "Y" or any record with an "N" validity indicator. 15 ECRS Functional Description (Rev. 82, Issued: , Effective: , Implementation: ) In general, there are two ECRS submission processes. 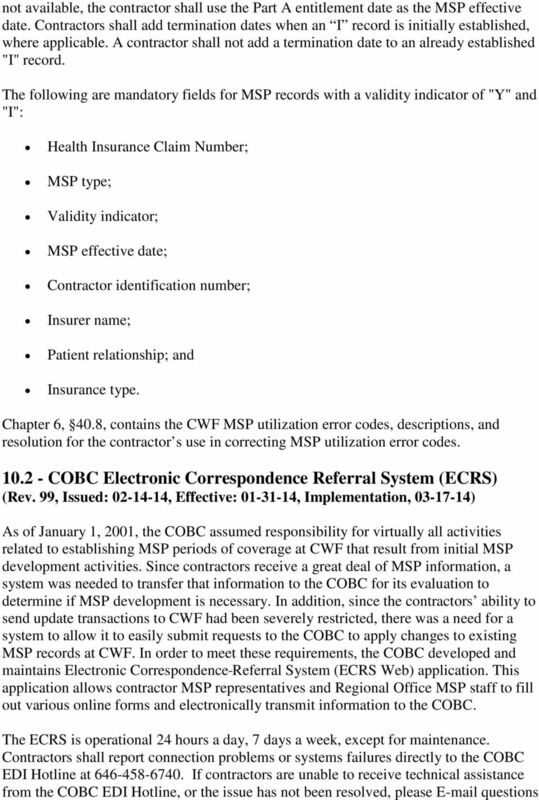 The MSP inquiry process is used to transmit information to the COBC where no related MSP record exists on the CWF. The CWF assistance request is used to transmit information to the COBC to modify or delete existing MSP information currently residing on the CWF for any type of MSP situation (including CMS Data Match records). 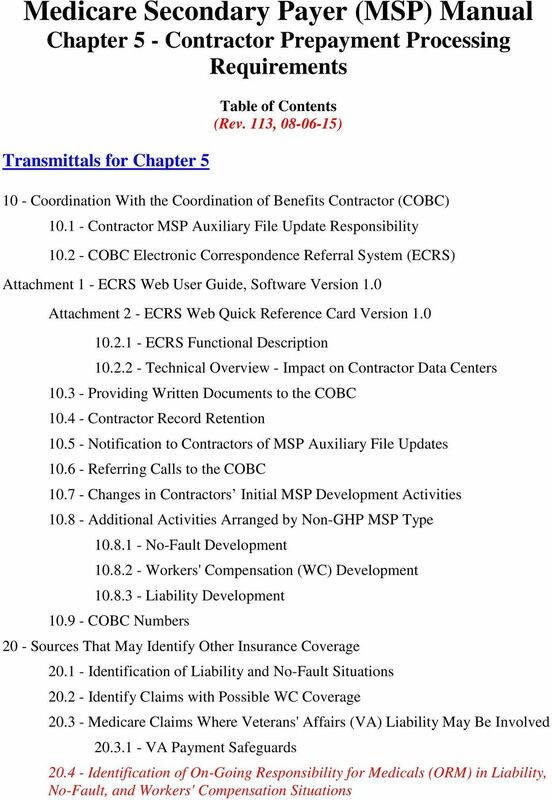 Contractors shall refer to the ECRS Web User Guide-Attachment 1 for step-bystep instructions on how to submit MSP inquiry and CWF assistance request transactions to the COBC, and how to perform status inquiries on previously submitted transactions. 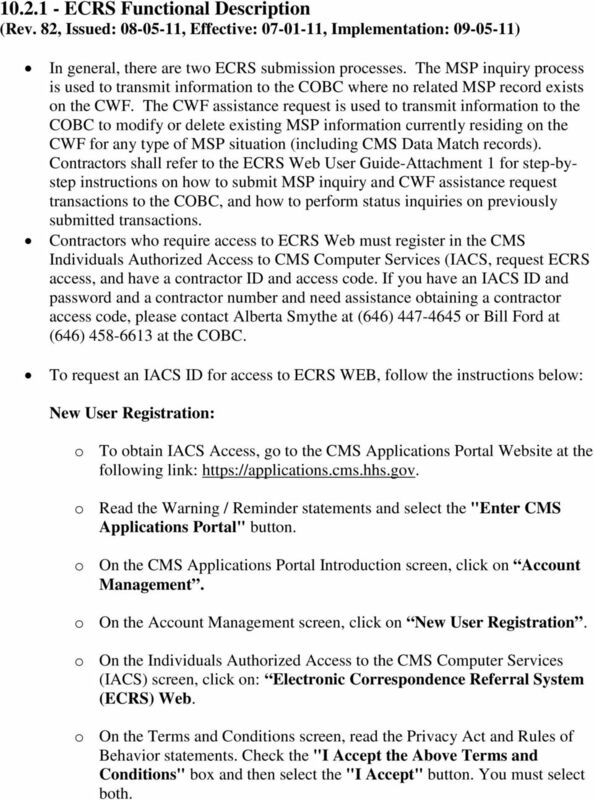 Contractors who require access to ECRS Web must register in the CMS Individuals Authorized Access to CMS Computer Services (IACS, request ECRS access, and have a contractor ID and access code. If you have an IACS ID and password and a contractor number and need assistance obtaining a contractor access code, please contact Alberta Smythe at (646) or Bill Ford at (646) at the COBC. 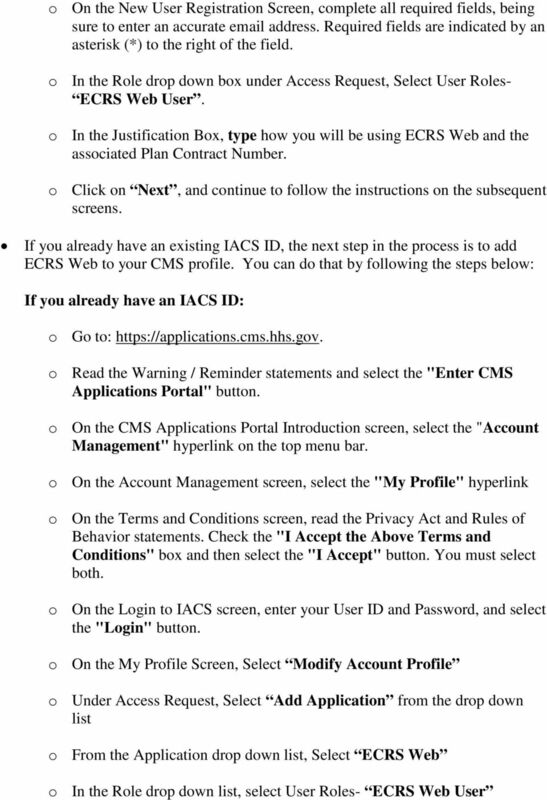 To request an IACS ID for access to ECRS WEB, follow the instructions below: New User Registration: o To obtain IACS Access, go to the CMS Applications Portal Website at the following link: o Read the Warning / Reminder statements and select the "Enter CMS Applications Portal" button. o On the CMS Applications Portal Introduction screen, click on Account Management. o On the Account Management screen, click on New User Registration. 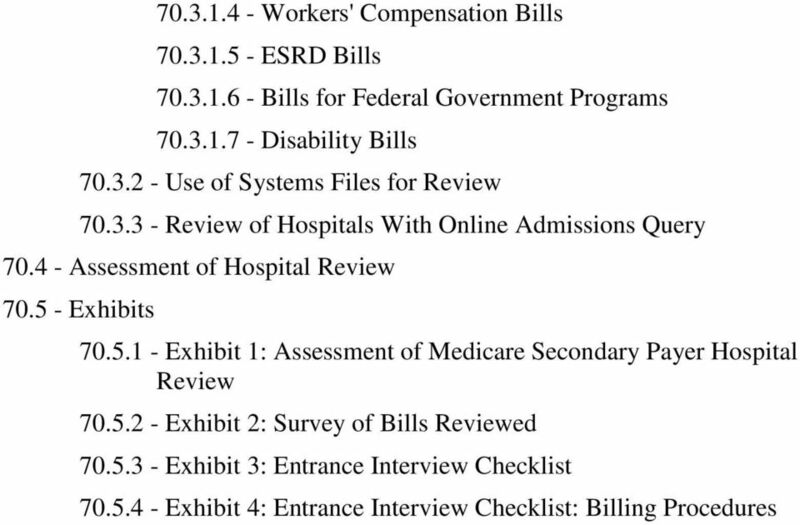 o On the Individuals Authorized Access to the CMS Computer Services (IACS) screen, click on: Electronic Correspondence Referral System (ECRS) Web. o On the Terms and Conditions screen, read the Privacy Act and Rules of Behavior statements. Check the "I Accept the Above Terms and Conditions" box and then select the "I Accept" button. You must select both. 17 o In the Justification Box, type how you will be using ECRS Web and the associated Plan Contract Number. o Click on Next, and continue following the instructions on the subsequent screens. Next Steps: o After you complete the IACS New User Registration or have added ECRS Web to your IACS profile, you will be sent an confirming that IACS has received your request and providing you with a Request Number. You should use that request number if you need to contact the COBC EDI Hotline regarding your request. 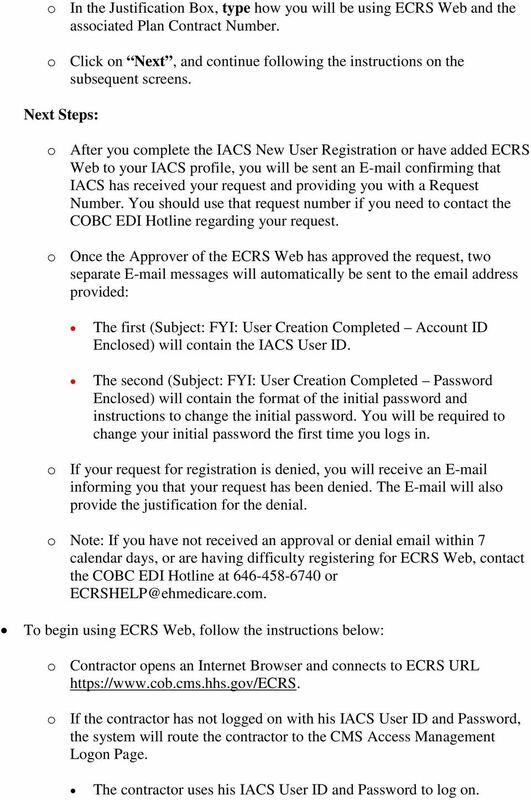 o Once the Approver of the ECRS Web has approved the request, two separate messages will automatically be sent to the address provided: The first (Subject: FYI: User Creation Completed Account ID Enclosed) will contain the IACS User ID. The second (Subject: FYI: User Creation Completed Password Enclosed) will contain the format of the initial password and instructions to change the initial password. You will be required to change your initial password the first time you logs in. o If your request for registration is denied, you will receive an informing you that your request has been denied. The will also provide the justification for the denial. o Note: If you have not received an approval or denial within 7 calendar days, or are having difficulty registering for ECRS Web, contact the COBC EDI Hotline at or To begin using ECRS Web, follow the instructions below: o Contractor opens an Internet Browser and connects to ECRS URL o If the contractor has not logged on with his IACS User ID and Password, the system will route the contractor to the CMS Access Management Logon Page. The contractor uses his IACS User ID and Password to log on. 19 after which the CICS application will be discontinued and all ECRS access will have to be performed via the ECRS Web. Contractors submitting batch files directly to the COBC Data Center via Connect: Direct can contact the COBC EDI Providing Written Documents to the COBC (Rev. 69, Issued: , Effective: , Implementation: ) Contractors do not routinely submit paper documentation to the COBC. However, if requested by the COBC, they shall submit written supporting documentation via fax to the COBC within five (5) business days of their receipt of the request. The COBC shall contact the contractor via phone for fax request. The COBC fax number is (646) There are limited situations where the contractor should mail paper documents to the COBC. Contractors shall forward to the COBC, within forty-five (45) business days of their mailroom date-stamped receipt, any development form originally sent from the COBC that the contractor inadvertently received. 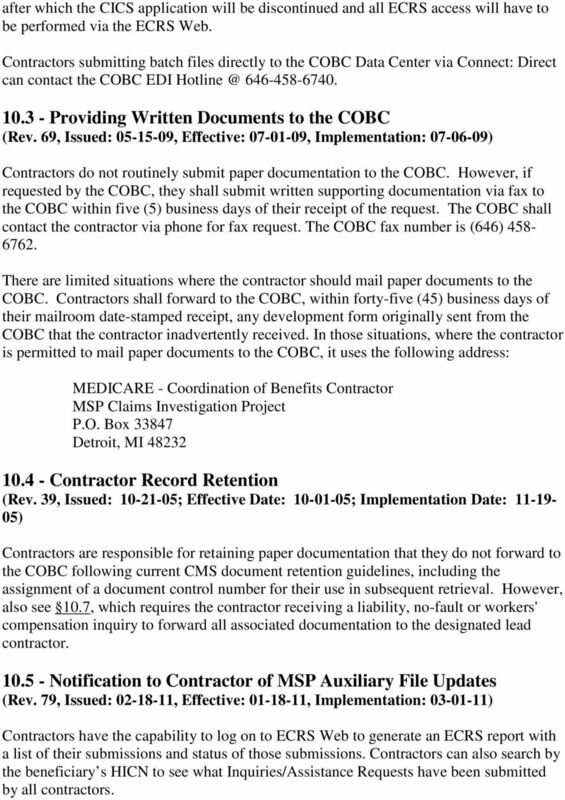 In those situations, where the contractor is permitted to mail paper documents to the COBC, it uses the following address: MEDICARE - Coordination of Benefits Contractor MSP Claims Investigation Project P.O. Box Detroit, MI Contractor Record Retention (Rev. 39, Issued: ; Effective Date: ; Implementation Date: ) Contractors are responsible for retaining paper documentation that they do not forward to the COBC following current CMS document retention guidelines, including the assignment of a document control number for their use in subsequent retrieval. However, also see 10.7, which requires the contractor receiving a liability, no-fault or workers' compensation inquiry to forward all associated documentation to the designated lead contractor Notification to Contractor of MSP Auxiliary File Updates (Rev. 79, Issued: , Effective: , Implementation: ) Contractors have the capability to log on to ECRS Web to generate an ECRS report with a list of their submissions and status of those submissions. Contractors can also search by the beneficiary s HICN to see what Inquiries/Assistance Requests have been submitted by all contractors. 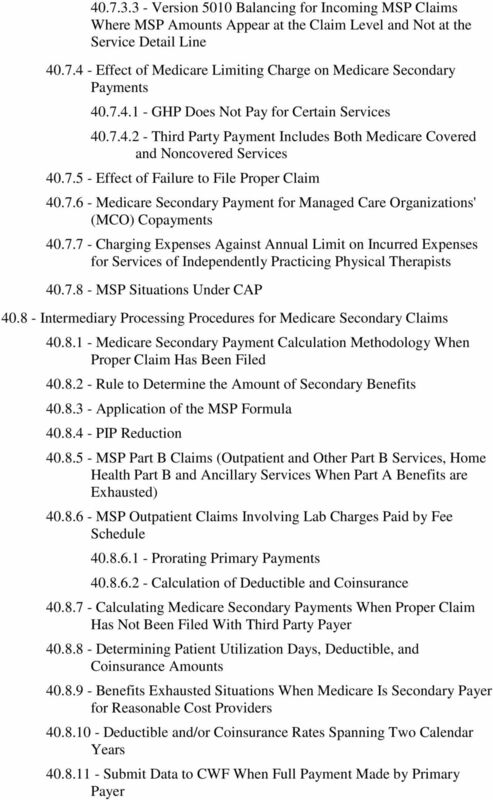 24 counterparts, or any other source indicating Medicare has been billed for services when there is a possibility of payment by an insurer that is primary to Medicare; The health insurance claim form shows that the services were related to an accident (i.e., the diagnosis is due to trauma) or occupational illness (e.g., black lung disease) or were furnished while the beneficiary was covered by a GHP or an LGHP which is primary to Medicare; The CWF indicates a validity indicator value of "Y" showing the presence of MSP coverage; Information in a MAC's records indicate a primary payer; There is an indication that the beneficiary previously received benefits or had a claim pending for insurance that is primary to Medicare. The MAC assumes, in the absence of information to the contrary, that this coverage continues. Medicare has not made payment and the MAC is asked to endorse a check from another insurer payable to Medicare and some other entity. The MAC returns the check to the requester and advises that the insurer pay primary benefits to the full extent of the GHP's primary obligation. 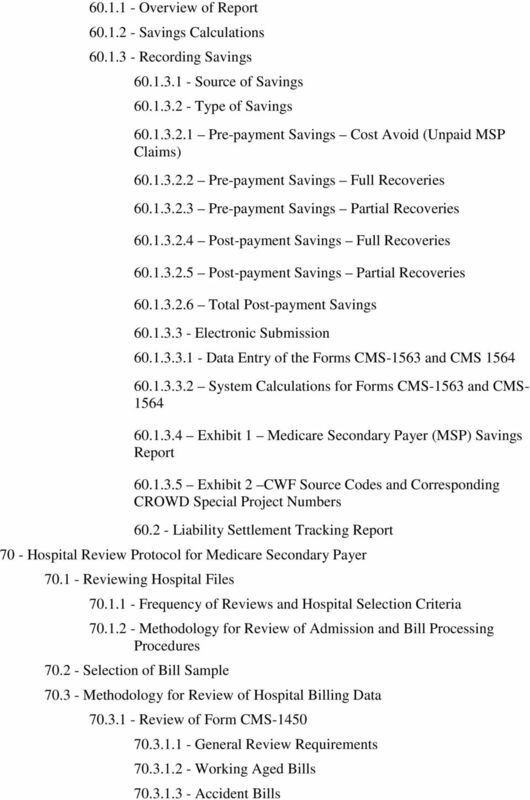 (The MAC follows the recovery instructions in Chapter 7, "Contractor MSP Recovery Rules," and Chapter 3 of Pub , the Medicare Financial Management Manual, if the check relates to services for which Medicare paid primary.) 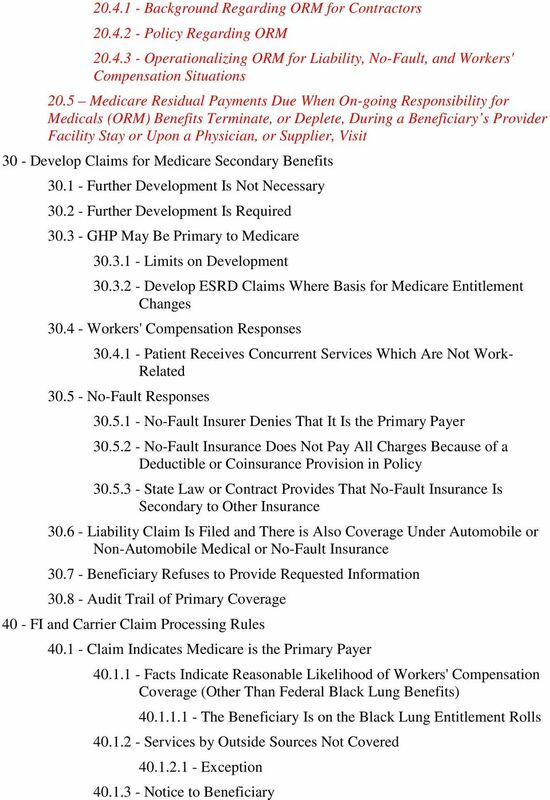 As necessary, it follows up with the provider, physician, supplier, beneficiary, and/or attorney to find out if the beneficiary receives payment from the GHP; Medicare receives or is informed of a request from an insurance company or attorney for copies of bills or medical records. Providers are instructed to notify the COBC promptly of such requests and to send a copy of the request. 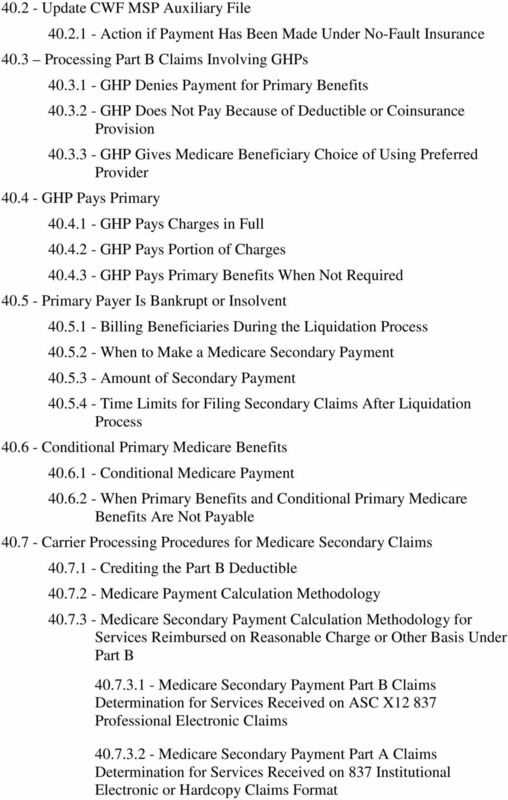 If the request is unavailable, providers are to provide full details of the request, including the name and HICN of the patient, name and address of the insurance company and/or attorney, and date(s) of services for which Medicare has been billed or will be billed; Where a GHP's primary coverage is established because the individual forwards a copy of the GHP's explanation of benefits and the individual meets the conditions in Chapter 1, 10, the MAC processes the claim for secondary benefits; or Claim is billed as Medicare primary and it is the first claim received for the beneficiary and there is no indication that previous MSP development has occurred.